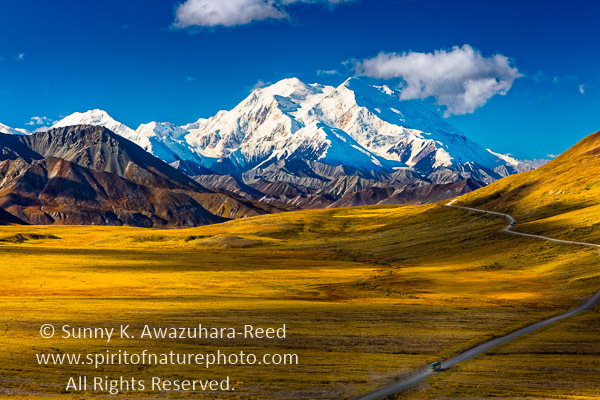 Continuing from a previous post, I would like to share more images of North America's highest peak - Denali (Mt. McKinley). 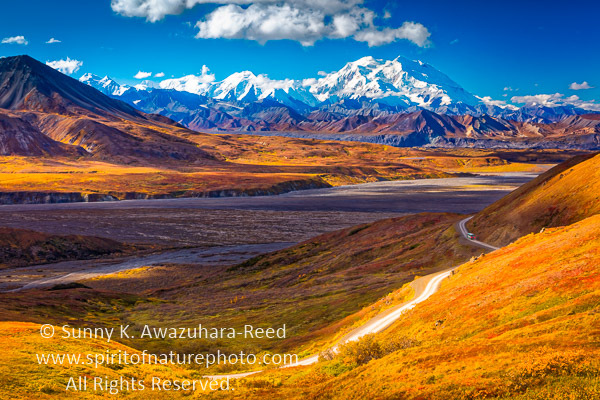 I camped deep inside Denali National Park & Preserve to capture Mount Denali in bright fall colors. 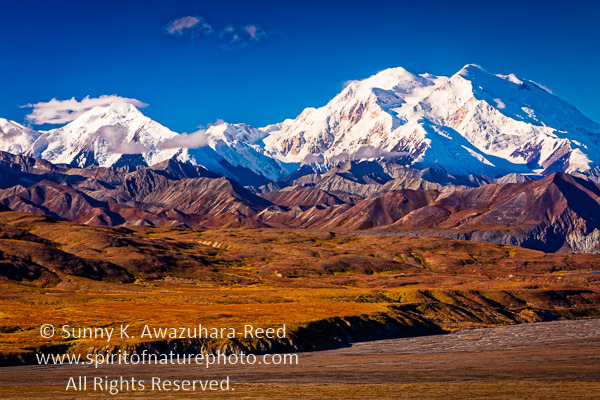 With unusually nice weather, I successfully photographed five beautiful sunsets of the famous North Face of Denali. 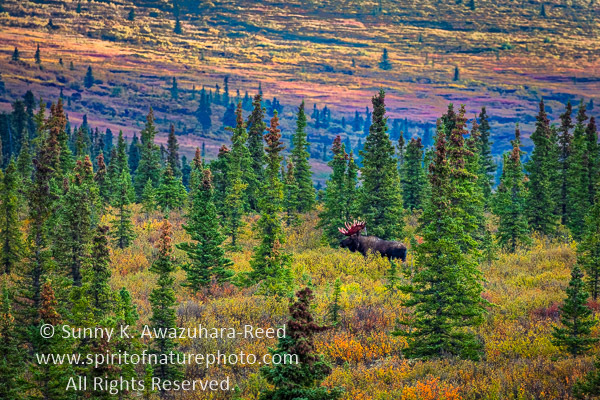 In addition, I captured the view from the Eielson Visitor Center, another well-known park icon. 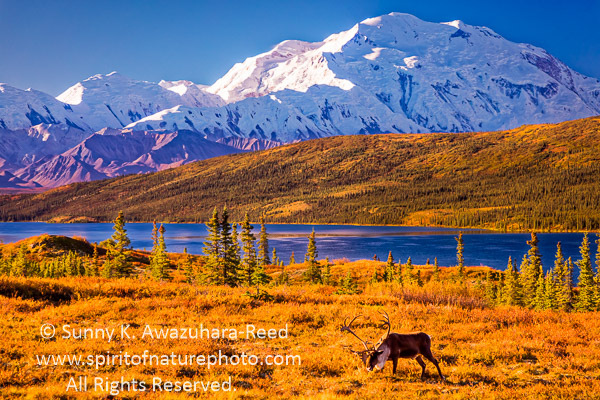 I climbed the ridge above the Eielson Visitor Center to get a better view of the valley with Mount Denali and the Alaska Range. 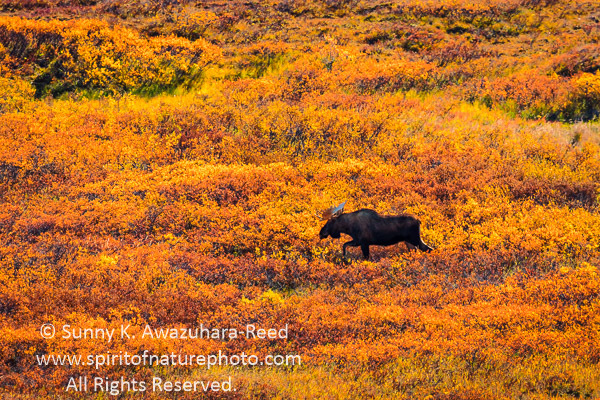 The surrounding tundra was draped in warm autumn colors. 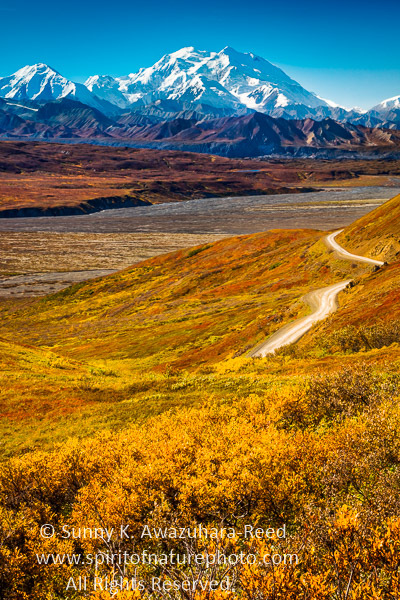 I discovered the view of Denali from Stony Hill to be stunning and easily became one of my favorites. 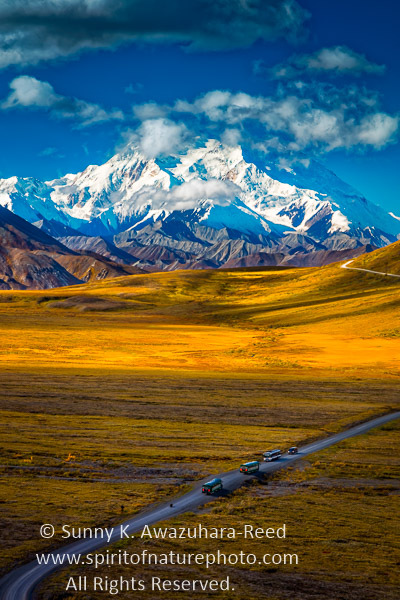 When visitors ride the shuttle from the entrance, Mount Denali can be seen in its entirety only after a few hours of riding. When the bus turns the corner on clear days, the view is impressive. I clearly remember that awe inspiring experience back in 2001. 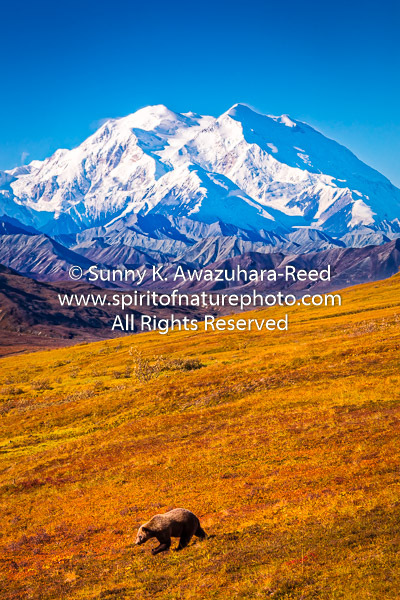 I wanted to capture this "first impression" of Denali. I had to wait a few hours for perfect lighting at Stony Hill... Dozens of shuttle buses passed by as clouds drifted by... I like the shadows of clouds on the vast tundra field. A few hours passed easily, I noticed a few buses stopping on the road down below... 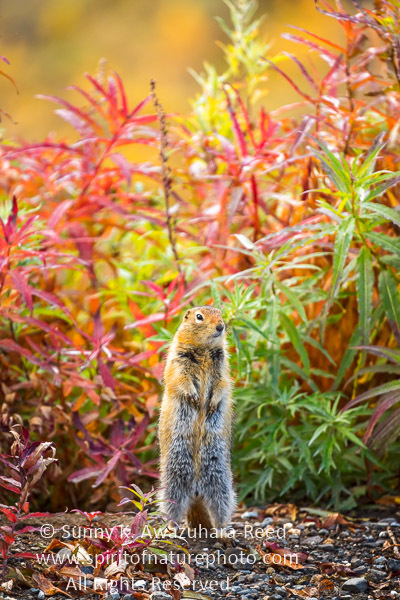 This means wildlife presence, normally. Sure enough, I spotted a small black dot moving on the road. It was a bear - a grizzly bear! More buses joined the bear viewing. Those passengers were lucky to see the bear very close by. 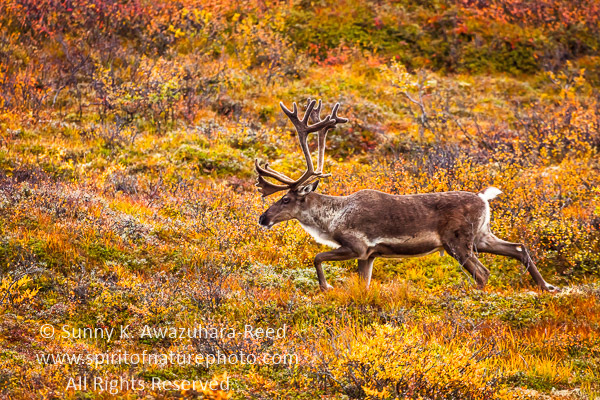 Slowly, the black dot moved away from the road and walked into the hilly tundra. The bear started climbing up the hill ... It was a small dot and soon its was out of sight from where I was at. Then, the next time I saw him, the small dot got bigger and closer. He was coming my direction! I quickly packed up my gear and began walking to one of the shuttle buses parked by. The bear climbed up this steep hill so fast and with ease. The shuttle driver yelled to the passengers to get inside the bus. I too joined them. 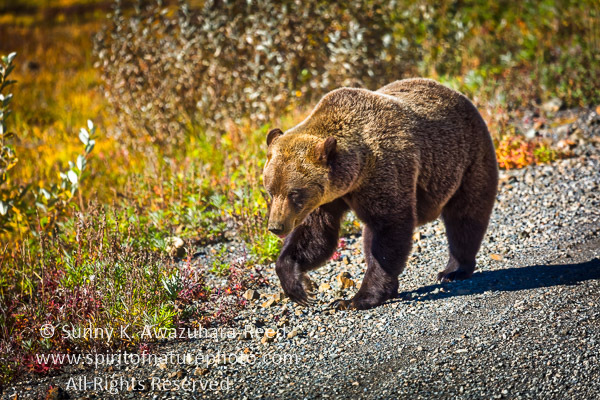 Soon, the huge grizzly bear came close and walked behind the bus then crossed the road! Thank goodness, the bus was here at that moment. 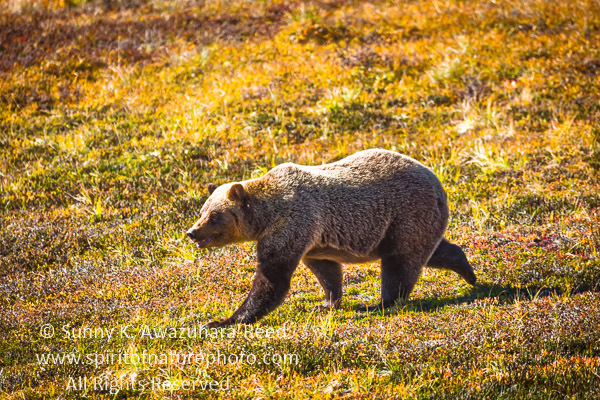 Here is another photo of the Grizzly Bear, I took earlier in the day. 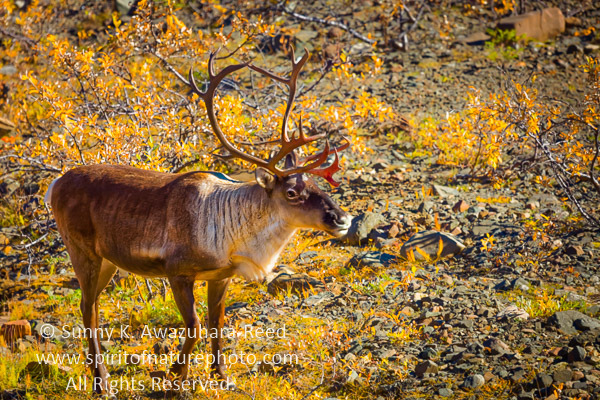 I'll have some more Denali images to share on the next posting. Please check back soon!